Animated by a deep longing to know, love and serve God, Bishop Noll Institute seeks to form students’ character and faith in the Roman Catholic tradition. As a key component of this overall program,Campus Ministry is a vital expression of our school’s Catholic mission. 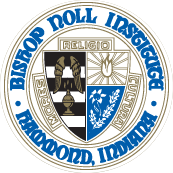 Bishop Noll Institute challenges students to transcend academic excellence to become young men and women for others, having not just sharp minds but also compassionate hearts. Campus Ministry invites students to actively explore their beliefs and doubts so that they can better understand and know the God who loves them and build a strong foundation of faith. In this way, our students grow in faith and ideally dedicate themselves to active participation in both their religious and civic communities through service to others. 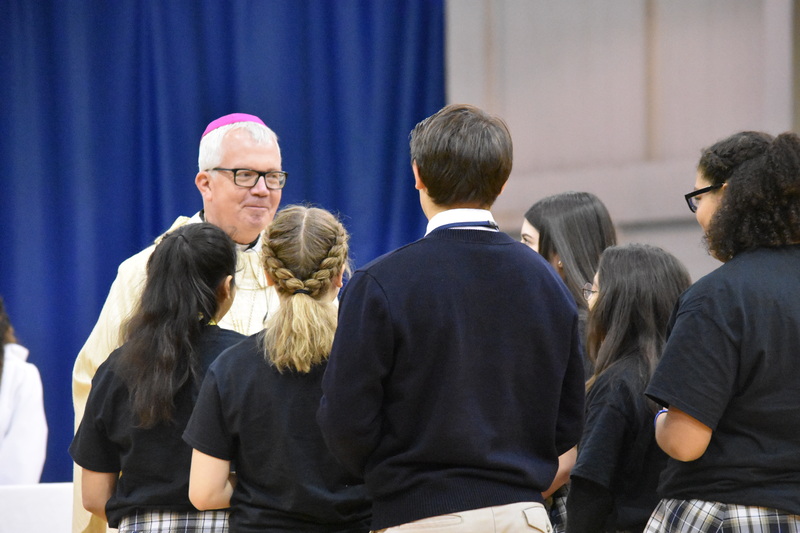 Campus Ministry supports the spiritual formation of all members of the Bishop Noll community in a manner that is both inviting and respectful of each person’s faith tradition and personal experience. Members of all denominations and faiths are welcome in all that we do as a community, as we encourage a spirit of understanding and dialogue in our journey to find God. Students participate in one all-school Mass every month, celebrated on a Church feast or within a particular Church season. Additionally, each class has a “Class Mass” once each year. Students are encouraged to participate within the Mass as Altar Servers, Readers, Extraordinary Ministers of Holy Communion, Gift-Bearers, ushers, and Mass coordinators. Students interested in these ministries should see Mr. Masterton to get involved. The Sacrament of Reconciliation is available anytime, by appointment with the Chaplain. We will also hold organized services with several visiting priests during Advent and Lent. Retreats: We must retreat to move forward. Retreats offer us the time, space, and context to reflect on our lives and grow as children of God. The busy pace of our lives and schedules often leave little to no time for prayer or self-reflection, so we take a few days to step away from the routine and examine it all. Our day-to-day lives often take place in the same settings repeatedly, from our bedrooms and family rooms at home to the same hallways and rooms at school; retreats take us out of our normal environment and bring us to a place that is comfortable, quieter, and different to help us gain perspective. Moreover, the nature of lunch-table chatter, texting conversations, or Twitter exchanges can be light-hearted and fun but can also exclude more serious and pressing topics; on retreat, we try to slow down, trust each other, and forge bonds so that we can share what's really going on with each other and with God, and have a good time along the way. Retreats are meant to give us perspective that we take and apply to our lives going forward. Students are required to participate in one retreat per year as a requirement for graduation. Sophomores, juniors, and seniors will rank their three options for retreat in order of preference with reasons for their choice at the start of the year (freshmen have only one date for their retreat and must attend that offering). The rosters will be finalized soon after, and students must inform Campus Ministry of conflicts at least 14 days before the retreat or their retreat fee will be irrevocably allocated toward that retreat. Students who miss the retreat they sign up for through BNI Campus Ministry are responsible for making arrangements to attend an equivalent retreat on their own time and at their own expense; the retreat must be approved by Campus Ministry, which recommends students attend the Diocese of Gary’s TAPT Retreat. Cell phones are not allowed on retreats; students must hand over their cell phone before they board the bus to leave school or present a signed note from a parent/guardian stating that the student does not have a phone in their possession. Freshman Retreat: To welcome freshmen to Bishop Noll and get them started on their high-school faith journeys, the Freshmen Retreat occurs on campus and is led by Bishop Noll upperclassmen. The retreat helps freshmen become more comfortable by building community, confronting the challenges of high school, and becoming part of the Bishop Noll faith community. The day ends in a big Mass, inviting parents and families to share in this new beginning with their freshmen and celebrate our unity in Christ as a Church and a school. El Camino (The Way; Sophomore Retreat): “El Camino” is a famous, traditional pilgrimage trail in northern Spain. For over 1000 years, people have walked this road following only a set of yellow arrows painted on rocks, trees, trails, and signs. Without a map, pilgrims reach the great cathedral in Santiago, built on the tomb of St. James. Sophomores will be shown “the way” on this overnight retreat – a simple progression that calls retreatants to reflect on self, others, and God. This helps us gain self-knowledge, strengthen our relationships, and grow closer to God. This was retreat was planned entirely by Bishop Noll’s Student Ministry Team. Kairos (Junior Retreat): Kairos, a Greek word that means, “God’s time,” calls juniors to embrace timelessness in this intensive four-day Catholic retreat. Kairos uses personal talks from peer and adult leaders, small- and large-group discussions, periods of silence and reflection, various integrated prayer experiences, and the Sacraments to invite teens to more seriously discover God in all things. The real value of Kairos occurs in living out the values of the retreat in one’s everyday life, so follow-up “Fourth Day Meetings” occur at school to sustain the impact of the retreat for all Kairos alumni. Senior Retreat is held at Cabrini Retreat Center in Des Plaines, IL. More info at cabrinicenter.org. Because these retreats require facility rentals, lodging, meals, supplies, bus reservations, and other expenses, all students are charged an annual “Retreat Fee” of $100. The total cost of a student’s four retreats at Bishop Noll is divided into four equal payments, charged at the end of each of the four school years as the Retreat Fee. Students have many opportunities to be involved in Campus Ministries. The primary ministry of students comes through Student Ministry Team (SMT). The team meets as a group during Student Resource Time in Campus Ministry to tend to several outreaches in our community. Their work currently includes, but is not limited to, planning the Fall Prayer Service, organizing the Pro-Life Solidarity Day, participating in the Diocesan Prayer Service for Life, organizing the Catholic Charities Christmas Gifts, planning the sophomore overnight retreat, and visiting a local senior home; in 2015-16, SMT will undertake coordinating Mass ministries (altar servers, readers, gift-bearers, and Eucharistic Ministers), planning Class Masses, investigating how to begin faith-sharing communities on campus, launching a community spirituality blog, and growing BNI’s service presence in the community. Additionally, students can be ministers at Mass. All students are welcome to serve as gift-bearers or readers. Students with previous training can serve as Eucharistic Ministers and altar servers; those without training can request it from Campus Ministry. Students interested in being music ministers can join Bishop Noll’s choir, which leads music at our liturgies under the direction of Mr. David Herr. Also, as previously stated, students can join SMT to work as planners. Many peer leadership opportunities are also available through Bishop Noll’s retreats. Student leaders are needed on all retreats offered by Bishop Noll. Retreat leaders are responsible primarily for leading a small group, which places heavy emphasis on listening and directing skills. Leaders are often asked to prepare witness talks in which they reflect upon and tell stories from their lives; these stories aim to explain lessons they’ve learned and the ways they’ve gained knowledge and deeper awareness of themselves, of others, and of God. · Freshmen Retreat is led by juniors and seniors who apply and are selected in the previous spring. Sophomores are invited to assist with the retreat as Support Staff. · El Camino (the sophomore retreat) is led by the volunteer members of SMT who served on the Retreat Planning Team. · Kairos (the junior retreat) is led by students who have already attended Kairos. Kairos alumni can apply to lead anytime after they attend the retreat, with applications usually re-released to students about 1-2 weeks after each Kairos retreat. Students who are not selected for a particular retreat can leave their applications on file for consideration for each Kairos until they graduate. · Senior Retreat does not have formal leaders; instead, seniors volunteer to be small-group facilitators. They undergo a brief orientation and receive basic training in order to simply facilitate a few conversations for their small-group. 1. Direct service. To give students a chance to serve alongside those in need, not just by providing a good or service, but also by sharing a moment of encounter to humanize and de-abstract those people who we marginalize and presume to be disposable. 2. Dialogue and experience for learning. To teach students about organizations that are living out justice by companioning marginalized people. 3. Exposure to ongoing faith. To show students that they can continue living out their faith, both in prayer/worship and in service/doing justice, whether at a public/state school or a private/Catholic university or college. Fr. Kevin M. Scalf, C.PP.S., is a member of the Missionaries of the Precious Blood religious order and is currently the Parochial Vicar for the Whiting/Robertsdale cluster of Catholic parishes within the Diocese of Gary. He also serves as Chaplain at Bishop Noll Institute, Hammond, IN. Fr. Scalf possesses a Bachelor of Arts degree from the College of Mount St. Joseph, Cincinnati, OH., in Religious Studies, Philosophy, and Communication Arts. He has completed a Master of Arts degree in Theology at Xavier University, Cincinnati, a Master of Arts in Biblical Studies at Mount St. Mary’s Seminary, Cincinnati, and a Master of Divinity degree at Catholic Theological Union, Chicago. Fr. Scalf has been a member of the faculty and campus ministries at Covington Catholic High School, Covington, KY., and The Summit Country Day Upper School, Cincinnati, OH. He was also a member of the part-time religious studies faculties at the University of Dayton and Calumet College of St. Joseph; a full-time member of the faculty and administration at St. Joseph’s College, Rensselaer, IN, and part-time faculty at a graduate seminary in Tanzania, Africa. His areas of academic concentration are Biblical Studies and Moral Theology. He has taught for many years in the Lay Ecclesial Ministry Programs and Deacon Formation Programs for the Diocese of Gary, Diocese of Lafayette-in-Indiana, and Archdiocese of Chicago. Fr. Scalf has been appointed by Bishop Dale Melczek to the Pastoral Council for the Diocese of Gary and was elected to the Priest’s Council for the Bishop. Fr. Scalf directs retreats and workshops for adults and adolescents. He currently resides at St. John the Baptist Parish rectory, Whiting, IN. He is an alumnus of Archbishop Elder High School, Cincinnati, OH. Miss Bolakowski (better known as Miss B) is the Campus Minister. She earned her Bachelor of Arts degree in English Education from Ball State University, a Master’s Degree in Education from Indiana Wesleyan University, and a certificate in Lay Ecclesial Ministry from the Diocese of Gary and Catholic Theological Union. During 26 years in both public and Catholic schools, Miss B has taught English, Theology, journalism, speech, and theatre arts. She was most recently the Campus Minister at Andrean High School, where she directed the Kairos and underclass retreat programs, student ministry team, and the community service program, as well as staff, parent and alumni ministries. Miss B looks forward to bringing her energy and love of the Catholic faith to BNI’s well-established student ministry and retreat programs, and is open to creating additional opportunities that will help all Warriors become the best version of themselves that God calls us all to be! 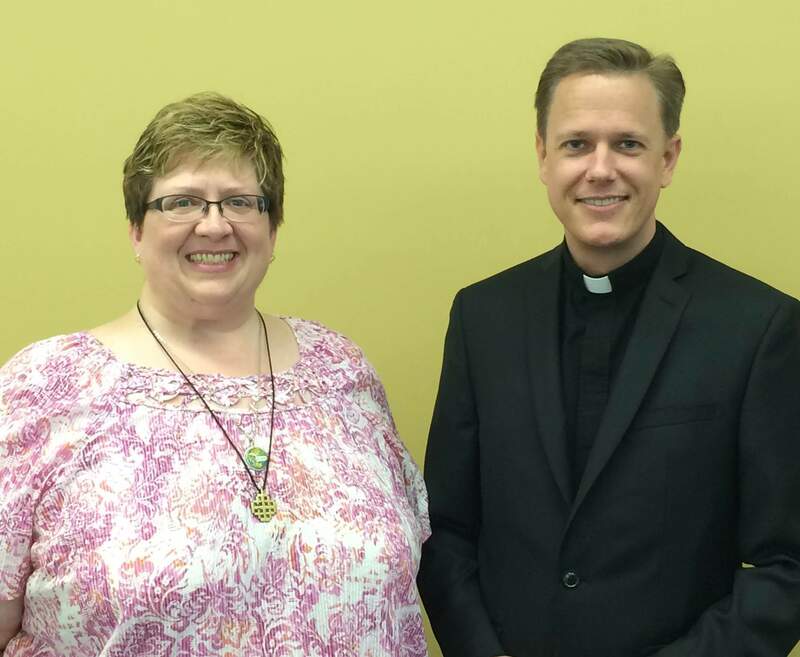 BNI Campus Minister, Stacia Bolakowski and BNI Chaplain, Fr. Kevin Scalf, C.PP.S.